Preferred Habitat: Originally arid areas of the Southwest. Now widely adapted to urban environments. Seasonal Occurrence: Very common throughout the year. Breeds in our area. Profile by Glenn Olsen: To many homeowners in the Houston area, White-winged Doves are a common bird found at their backyard bird feeders. For some this comes as no surprise -- that is just the way it is -- but for others, they recall a time when this species was not found at feeders or anywhere else in Houston. 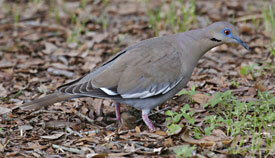 What changed to make the White-winged Dove a common bird of Houston? By most accounts, it is loss of habitat in the bird's original range. Historically, in Texas this species was found primarily in the Lower Rio Grande Valley. This south Texas habitat was primarily grasses, small trees, and thorny brush thickets in the extensive semi-arid areas. White-winged Doves fed on seeds of grasses and wildflowers. Typically, nesting was in taller trees and shrubs along rivers and streams where the cover was denser and affords greater concealment. That habitat is very different from the typical Houston backyard. As agriculture developed in the Valley, almost all of this "brush habitat" was cut, burned, and converted to irrigated fields of various vegetables. The White-winged Dove population declined severely. As the Valley began growing citrus orchards, these small trees offered new nesting sites to replace those lost. This helped to a limited degree and the population increased. Other accounts link extensive fires for destroying the brush land habitat used by White-winged Doves in Mexico. This forced the birds to look elsewhere for suitable habitat. Not finding sufficient room just across the border, they continued north—to Houston and now beyond. Yet others think that global warming has caused this species and other species to expand their range northward. Whatever the cause, the White-winged Dove has adapted remarkably well to an urban environment that could not be more different than its original habitat. Fortunately, for this species it has been able to adapt to dramatic changes in its historical habitat. Unfortunately, for other species of doves, such as the smaller Mourning and Inca doves, this larger species seems to be displacing both of these at the backyard feeder and in the urban environment. And we should not be lulled into the erroneous belief that most birds are as adaptable as the White-winged Dove! We need to support those organizations that preserve and protect habitat for all species.